Ralph Thorn is an independent piano technician, specializing in rebuilding historically significant pianos, whether it be your family’s 20th century heirloom grand or upright, or an early 19th century piano most suited for performance of Haydn and Mozart. Ralph has worked his entire career in the piano business, and is a full-time piano technician. Ralph Thorn provides piano tuning services to London and Middlesex County, and is able to repair any piano performance or structural problem. As an accomplished musician, Ralph Thorn can offer professional advice on how to maximize your piano’s musical capability. He brings to your piano a keen ear and a sensitive touch. Residing with his wife on their country property outside Strathroy since 1983, Ralph serves customers in London, Strathroy and throughout Middlesex and Lambton counties (Ontario, Canada). Ralph Thorn studied piano from the age of six with Doris Watts of London, Ontario, attaining his A.Mus Performance. He progressed to playing organ in church, studying with Gordon Atkinson, reaching his 2nd A.Mus. For 35 years Ralph Thorn worked as a church music director, retiring from regular weekly duties in 2004, but since then has served as interim music director in various churches. Although Ralph was intending to pursue a career in the sciences, his musical background drew him to study the relationship between music and physics. A math project in high school focussed on the mathematics of sound harmonics and their use by piano tuners (he got a perfect score), and while in university Ralph was commissioned to modify an electronic keyboard to have four different styles of tunings for use in the Physics of Music course. While at university Ralph Thorn started working part-time at a music store as an instructor of piano and organ, and was soon engaged as their Service Manager. With the encouragement and guidance of the technicians engaged by the London Yamaha Music Centre, Al Windsor and Don Stephenson, Ralph attended technical workshops offered by Yamaha, where he found his true calling in caring for pianos. Since becoming independent in 1975, he has served the London Ontario region, his rebuilding skills sought by music schools, teachers and private owners of pianos. 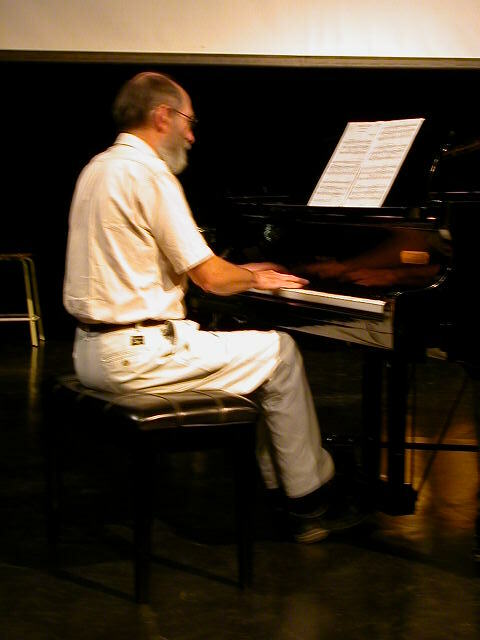 Along with his full-time piano work, Ralph Thorn has been involved in many musical and community pursuits, including 19 years as a Sea Scout leader and serving on the boards of Royal Canadian College of Organists, Strathroy District Arts Council, Jeunesses Musicales of Canada and Jeunesses Musicales of Ontario, as well as on committees for the Strathroy Hometown TurkeyFest and the Municipality of Strathroy-Caradoc Progress Through Partnership. He is a recipient of the Queen Elizabeth Diamond Jubilee Medal and the Medal of Distinction from the Municipality of Strathroy-Caradoc for his contributions to the arts. Ralph Thorn and his wife Frances met in the Strathroy Chorale, Strathroy’s community choir, where he was their accompanist from 1969 to 1987. Since 1996 he has been their Music Director. Always interested in things historical, Ralph Thorn has developed a rapport with early instruments, often working on pianos of the early and mid-19th century. Many other technicians refer work on projects of this time period to Ralph because special tools, materials and skills are required in this work, including patience and perseverance for which he is particularly known. Ralph is particularly pleased to have assisted the careers of three people who apprenticed with him and whom are now full-time piano technicians, just as he was so generously helped by established technicians. Ralph is a regular contributor to piano technician discussion groups.